ABC is launching a new show, a comedy called “Modern Family” and one of the ways they’re creating buzz is by giving a preview of the show to a relatively small group – just 20,000. This elite fan group are the “Inner Circle”, recruited by the station in earlier marketing campaigns, and they’ll get a code that lets them see the pilot programme on their ABC Player. The marketing plan behind this is that those in the “Inner Circle” will create a lot of buzz around the programme, particularly on social media tools, and ABC hopes the key will be shared. Google did a similar thing with the launch of gmail, initially you could only get an account if you were invited. What is interesting is both companies are promoting something that has potential to reach an unlimited audience. Once broadcast the TV show reaches all subscribers to that channel, and since it’s invitation-only release in 2004 gmail now has more than 100 million accounts. However they’ve chosen to create “scarcity”. Why would a business do this? 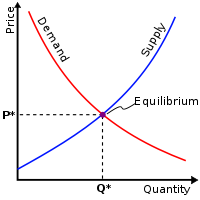 Simply to create a greater demand, basic economics says that if a supply is limited while demand grows then the price the supplier can ask rises. This is why strawberries are expensive at certain times of the year – it is not connected to the cost of production but a reflection on what pricing the market will permit. In the case of ABC the higher price would translate as larger audiences leading to greater advertising revenue. I’m curious to see how this will work out for ABC – will the buzz from 20,000 of the “Inner Circle” be enough to create a critical mass and win the ratings war? The show should be screening now, it will be interesting.